After Christmas it was difficult to find the right size bracelet for my best friend. The one I bought was too big and I didn’t want a cheapie. Love the one you showed. Now after a month, she will get her gift. Nice quality and very reasonable price! Display all of your favorite charms and beads with this contemporary European-style 3mm snake chain bracelet. Elegantly crafted with high polish sterling silver, this chic jewelry secures with a sturdy lobster claw clasp. Queenberry focuses on selling fashion jewelry made of .925sterling silver, pearls, Swarovski crystals, etc. Product designs include earrings, pendants, necklaces, bracelets, anklets, and European charms. 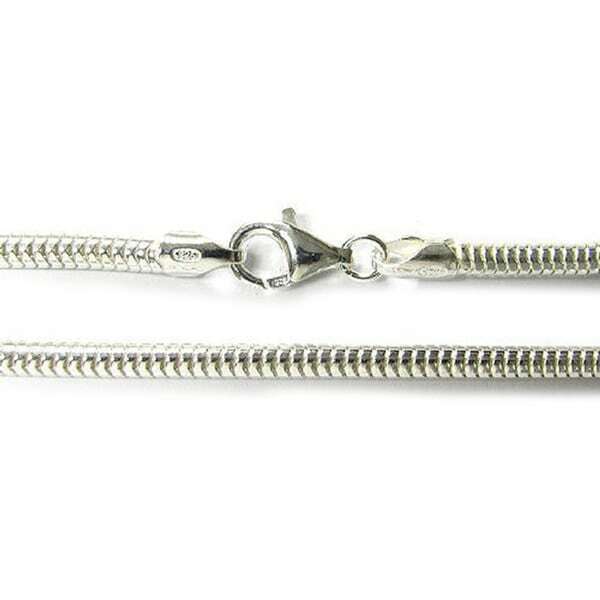 This sterling silver bracelet is perfect. Extremely well made and I have purchased several decorative glass charms, with different designs. Floral, sparkled and I plan on purchasing more I am also looking for larger sterling silver dangling charms. Great purchase Thanks for your variety of charms. I have two of these. The first I got as a gift. It was 71/2" and a perfect fit, but it wouldn't accommodate many beads. I added just a few to this bracelet and then purchased a 9" one, to which I added an entire bracelet-full of beads. They are both gorgeous and I have received many compliments on them both. They are well-made and beautiful. I started my daughter out with a charm bracelet, I call them our memory bracelet. It's something in your travels you can buy a charm as a memory. This bracelet is perfect. This bracelet is very attractive and the quality is great. The size fit most charms so I'm not limited in the types of charms that I choose to buy. Too thin of a chain for the gift I had in mind... looks cheap. I am returning it. This is not a good value. I would have given it one star except the patina of the silver was nice. I bought it with a charm and disliked both items from Queenberry. Great bracelet to add beads or charms to. Very well made . I purchased this bracelet to hold multiple barrel charms and it has worked out perfectly. It is substantial and sturdy enough to hold the weight and is good quality. Bought this because i have a pandora bracelet that has to many charms on it. I actually like this one better the my pandora one. Would buy again. great bracelets. I purchased for my nieces, so they could have Pandora like charms added to them. Didn't like this and broke easily. bought this as a gift for my daughter. very pretty and is very comfortable to wear. For the price this bracelet is beautiful. My original bracelet I had for several years broke in half and I need a new one.